Before we begin, some fundamental features need to be present in a router table for greater accuracy and ease of use. These features allow you to get the most out of your wood router, and help deliver the most accurate cuts possible. Without further ado, let us analyze the features of the Rockler Pro Phenolic router table and see if it passes our rigid inspection. A solid and flat top are very important factors in a router table because it dictates the final accuracy you get when working with this device. The Rockler router table has a 3/4" solid phenolic resin table that measures 24 x 32 inches. It is a large and offers a lot of maneuverability and freedom when working with materials that are long or short. The hard surface is super flat with no warping or uneven areas. This allows you to get the most accurate cut out of your router table. The base plate attaches the router to the table and is made from a solid machined aluminum that is able to withstand vibrations, as well as absorb it. It has a 1-1/2" insert ring opening with 8 points plate leveling as well as 2 locking points. The 8 plate leveling points make it compatible with a wide variety of wood routers, and the 2 locking points allow you to quickly and easily remove the base plate when required. The miter gauge is very helpful in a router table. It allows you to make exceptionally accurate cuts and especially helpful when making complex pieces like dados or delicate trims. Additionally, the Rockler router table comes with a T-slot that makes it compatible with aftermarket or branded miter gauges. Out of the box, it does not come with a miter gauge so you will either how to buy one, or use a gauge that you already own. But don't worry, miter gauges are usually not very expensive and most hardware stores sell them. In theory, they should be compatible with this router table as the miter gauge fittings of this Rockler router table obeys standard dimensions. The aluminum fence in the Rockler router table operates along the machined-engineered T-tracks. It is very easy to position and very maneuverable, which results in more accuracy when doing sensitive routing tasks. Maneuverability is very important if you want to make adjustments quickly and easily. It can also be locked in position with the T-knobs. Furthermore, you can even use your own aftermarket fence with this router table. This offers a lot of versatility and allows you to complete complex routing tasks in half the time required. The base needs to be sturdy with no wobbling when the wood router is operating. This is important when accuracy and a clean cut is desired. However, this Rockler router table is a portable unit that does not come with its own base stand. You will have to retrofit this device onto a router table stand that you already own, or you can simply bolt it to your workbench. To help keep your routing clean of sawdust and debris, a dust collection system is very important. The Rockler router table is fitted with a 2-1/2" dust port that allows it to work with most commercially available dust collection systems. If the dust port is too big for your dust collection system, you can always use 2-1/2 to 1-1/4 inches fitting adapter. Router Lift FX: This feature allows you to adjust the height of your router from the top of compatible wood routers by using a provided T-wrench. The Router Lift FX system in this router table works with models like the Porter-Cable 690/890 series, Bosch 1617-16-18, and DeWalt 610, 616, 618. 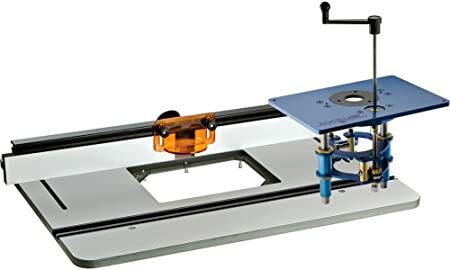 The Rockler router table comes with a tabletop, an aluminum baseplate with 8 router insert points, one aluminum fence, a T-wrench for the Router Lift FX as well as a transparent guard protector. Note that this model does not come with a stand. The accessories delivered with this router table are also very basic. We have seen better in other models but at the price, we cannot complain too much. The Rockler router table is offered at a very competitive price. It has a solid build construction and is built to last. Router tables are generally not the cheapest tools in the workshop but on the bright side, they last a very long time and should be a sound investment in the long run. We recommend the Rockler router table mostly because of its solid build quality made from phenolic resin and aluminum accessories. Super flat tabletop made from phenolic resin. There is no wobbling or uneven surfaces. Stock can easily glide on the tabletop surface with almost no effort. It offers very little resistance. Baseplate is machine engineered from a solid aluminum block. 8 insert points for compatibility with many wood routers. Easy to remove (or lock in position) thanks to 2 locking inserts. Aluminum Fence offers a lot of maneuverability for added accuracy. Also very durable and lightweight. Possibility to add aftermarket miter gauges and fence. Not delivered with a router table stand. Compatible only with Porter-Cable 690/890 series, Bosch 1617-16-18, and DeWalt 610, 616, 618 wood routers. The Rockler router table is a straightforward and useful tool in the workshop. It will make a great addition to your routing endeavors, and help boost your productivity by providing greater accuracy and ease of use. On the downside, it does not come with a lot of accessories and is a very basic router table. Therefore, it is offered at a more competitive and cheaper price than other router tables on the market. If you currently own compatible wood routers like the Porter-Cable 690/890 series, Bosch 1617-1616-1618, and DeWalt 610, 616, 618 - we can safely recommend this model because of its excellent build quality, ease of use and competitive price.